Shawn M. Odneal is the Midwest leader in growing-space technologies. Growing professionally for nearly 40 years, Shawn started his "growing" career on what is now 40+ acres of certified farmland in Northwest Ohio. From that foundation, his passion for science and technology developed and flourished at Bowling Green State University where he graduated with an advanced degree in Biotechnology and Chemistry. Moving to Cincinnati, Shawn worked for Sun Chemical Quality Laboratory and Proctor & Gamble’s Food Sciences and Microscopy divisions. Moving to Chicago in 2001 Shawn continued his studies at Northwestern University Medical School where he purified proteins, enzymes and cultured mammalian blood cells for the Oncology Department. These laboratory experiences vaulted him into complex technical sales, marketing and consulting for two of the world leaders in global healthcare, Whatman (GE Healthcare) and Becton Dickinson (BDX). His sales career was highlighted by a $5M, 5-year competitive conversion contract at Loyola Hospital and Medical School. Shawn left corporate America in 2010 to seek his own business ventures. 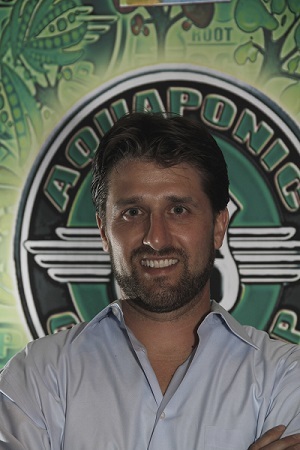 Later that year he established OHASS INC. and began doing business as Root 66 Aquaponic Garden Shop, a specialty retailer. "The Root", among other things, is a one-stop-shop for Organic, Hydroponic and Aquaponic gardening supplies and services. In four brief years, Shawn has trademarked several key words and developed strategic concepts like Hydroaquaponics, Gold Standard Plant Nutrients and the HarvestWall. He's now busy running retail websites, a brick-and-mortar store, branding his own plant nutrient lines and gardening supplies, developing content for all social media outlets and last but not least managing service representatives who care for growing-spaces across Chicago-land. His 2014 highlights include: a 300 sqft. out-door hydroponic living wall in downtown LaGrange IL., partnering on other sustainable growing-spaces with Triton College, COD and Acura, Westmont. Finally and most recently, Shawn has become an independent representative for several technologically advanced North American companies involved in synergistic industries, promoting their technologies to his current and future clients. Shawn can be easily reached at Root66GardenShop.com and info@hydroaquaponics.com.